The House Energy and Commerce Committee has come up with something they entitled The Energy Tax Prevention Act of 2011 that prohibits the EPA from regulating greenhouse gases. `SEC. 330. NO REGULATION OF EMISSIONS OF GREENHOUSE GASES. `(8) Any other substance subject to, or proposed to be subject to, regulation, action, or consideration under this Act to address climate change. `(A) IN GENERAL- The Administrator may not, under this Act, promulgate any regulation concerning, take action relating to, or take into consideration the emission of a greenhouse gas to address climate change. `(B) AIR POLLUTANT DEFINITION- The definition of the term `air pollutant' in section 302(g) does not include a greenhouse gas. Notwithstanding the previous sentence, such definition may include a greenhouse gas for purposes of addressing concerns other than climate change. Representative Ed Markey of Massachusetts tears into this nonsense. So how do you prefer your fluorocarbons? As an aside, I checked out the House Energy and Commerce site. Tweets from Republican members are displayed in a box entitled "what we're working on". 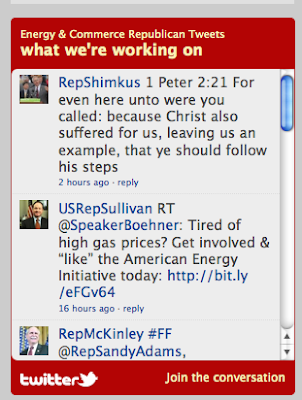 What is Rep Shimkus working on? I am *so* happy you're back to blogging.